GREAT HOME IN CUL-DE-SAC. NEWER ROOF, LEAF GUARD GUTTERS AND DOUBLE HUNG REPLACEMENT WINDOWS WITH VINYL TRIM. BEAUTIFUL HARDWOOD FLOORS IN BEDROOM & LIVING AREAS. LARGE LIVING ROOM/DINING ROOM COMBO IN ADDITION TO A STEP-DOWN DEN JUST OFF THE KITCHEN WITH A WOOD BURNING FIREPLACE. KITCHEN CABINETS JUST PAINTED WITH NEW HARDWARE. COVERED PATIO IN BACK WITH FENCED IN PRIVATE BACKYARD. 1 CAR ATTACHED GARAGE. SELLER HAS ALREADY FOUND REPLACEMENT HOME. Ready to visit 177 Bret Harte? Request a free property tour! Send me more information about the listing at 177 Bret Harte, Newport News, VA 23602, MLS# 10240152. 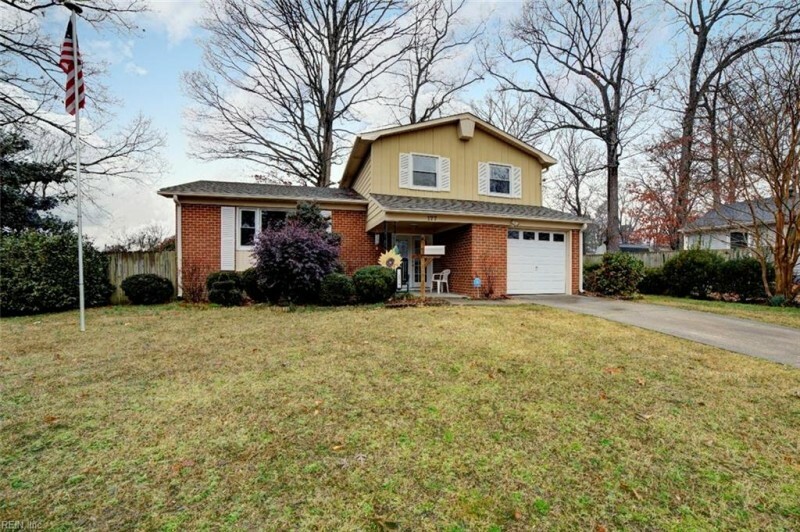 This 3 bedroom, 2 bathroom home located at 177 Bret Harte, Newport News, VA 23602 has approximately 1,486 square feet. It is currently listed for $189,900 and has a price per sqft of $12,779. This home is currently Under Contract under the MLS#: 10240152. This listing is provided by BHHS Towne Realty. 177 Bret Harte Drive, Newport News was built in 1971. It has Garage Att 1 Car, 2 Space, Driveway Spc, Street parking.The kitchen includes 220 V Elec, Dishwasher, Disposal, Dryer Hookup, Gas Range, Refrigerator, Washer Hookup. 177 Bret Harte is part of the Walden neighborhood located in 23602.